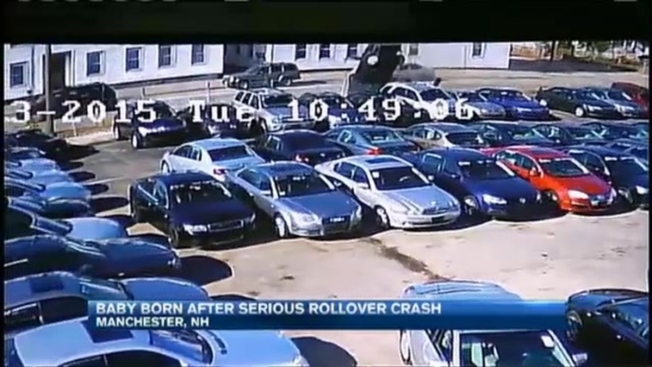 A pregnant woman seriously injured in a Manchester, New Hampshire, rollover crash delivered her baby Tuesday morning, according to family. The crash happened just before 11 a.m. Tuesday at the intersection of Beech and Silver streets. Manchester police say a preliminary investigation shows that a Mazda being driven by 24-year-old Greg Beaulieu of Manchester hit a Saab while changing lanes. The driver of the Saab, 28-year-old Dennis Beaudoin of Manchester, and his pregnant passenger, 23-year-old Brittany Beaudoin, also of Manchester, were seriously injured in the crash, according to police. Both Brittany and Dennis Beaudoin were taken to Eliot Hospital for their serious, but non-life threatening, injuries. Family confirms Brittany was seven months pregnant with her son, Aidyn, during the crash. Family confirms she had a C-section. Anyone with information is asked to reach out to Manchester police at 603-668-8711.